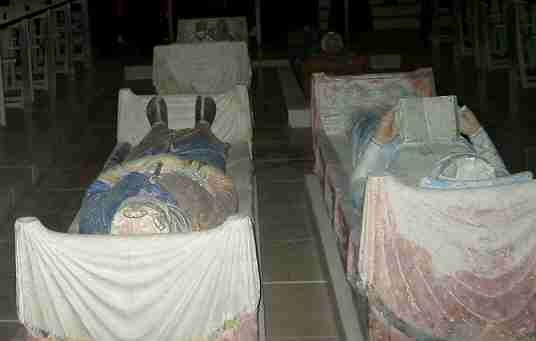 Who are these four recumbent figures from the middle ages? Participants of the 2003 Jupitour now know!! Richard the Lion Heart, Henry II, the widow of King John and Eleanor of Aquitaine, Richard's widow! Yes they are all there at the Abbaye Royale of Fontevraud in the Loire Valley. Boarding the shuttle for the train ride sous la Manche (under the English Channel). Ghislaine Nankivell dressed for the inclement weather that cleared the following day. It was rougher on the hovercraft which was how 14 Jupiters crossed. We didn't know then, but this was the last year of the hovercraft crossing the channel from Dover. Hoverspeed are now operating a giant catamaran. Two other Jupiters crossed by Le Shuttle that day. Jonathan Root at the Black Lion pub meeting, May 2002. May 2002 and Andy Stevens of Horsham, Sussex, GB, took delivery of the ex-Ken West ex-France LHD SC Jupiter. ex-France and is now under restoration in Sussex. Owner Andy Stevens is doing all the work. 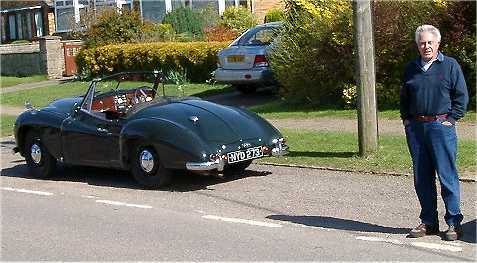 New wiring harness fitted, engine runs and has oil pressure - target first outing JOAC 2007 meeting. Brendan and Naomi Arnet write from New Zealand: Just the final picture before our Jupiter goes off to have some colour added to her to bring her back to life. The road has been a long one but it is becoming worth it. I think you will agree that Alan Bowden and the boys at Classic Cars Auckland have done a excellent job. As you can see, the car is now resprayed, retrimmed, and running around (since October 2005) looking very good indeed. Those Jowett people in NZ are just great people are they not? they know what to do and then go ahead and do it. 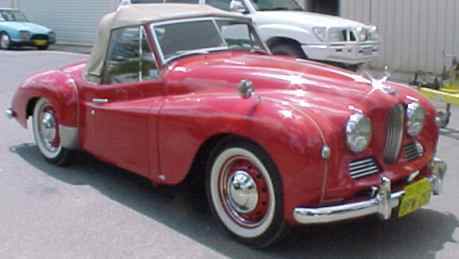 One of the pair of prototype Jowett Jupiters completed on the 23rd of March 1950, the one depicted below (modified in a number of respects) is back in England after nearly half a century sojourning in Canada. The many detail differences between it and standard production (if there is such a thing) have excited all Jupiter owners who have seen it. 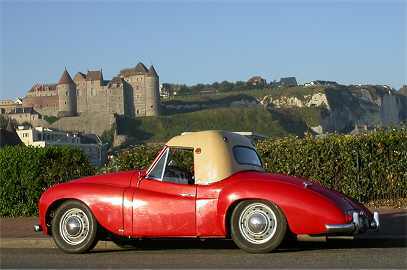 It was sufficiently well restored by its previous owners to be taken to France for the Le Mans 50/2000 celebrations and even driven while there - legally and with full papers. Well done Pat Lockyer - only you could have achieved this! 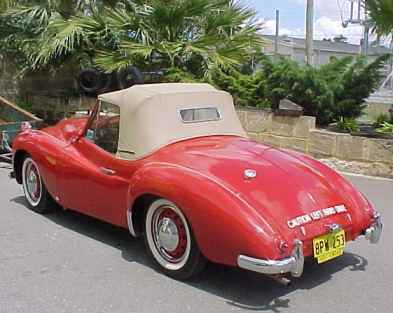 Brian Holmes and Barry Houston drove their Jupiters from Brisbane (Queensland) to Rockingham (Western Australia) which is a distance of 3000 miles with the journey taking 5 days - this is about 600 miles per day! Brian's round trip mileage was 6024 with Brian's daughter Sharon doing about half of them. Barry covered a mere 5994 miles. The Jupiters sustained 68-70mph for the duration and averaged about 33-34mpg. 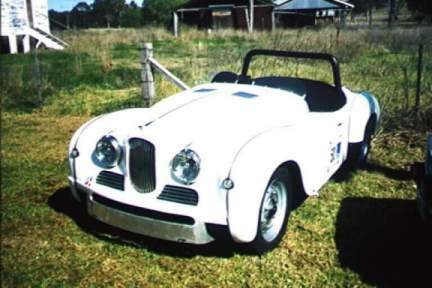 Ed Wolf drove his Jupiter from Sydney (NSW) to Rockingham which is 2700 miles (and then drove back). Two Javelins drove similar distances, from Adelaide, SA (1800 miles) and Burnie, Tasmania (2500 miles). The Holmes and Houston Jupiters took the long distance award, while Barry Houston won the award for Best Jupiter and Brian Holmes won the Gymkana, so the trek doesn't seem to have done the Jupiters or their crews any harm whatsoever! 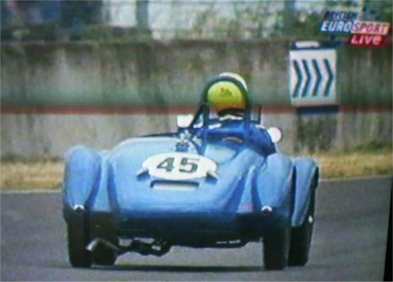 Below: Keith Clements in action in recent Historic Motor Sport. The Jupiter is where it belongs - in front of the MGs!!! 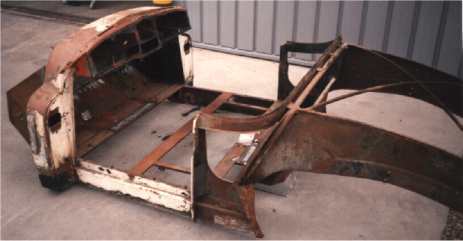 Jupiter chassis 115 was shipped as a rolling chassis to New Zealand on 7 August 1951. It was never built up into a Jupiter. 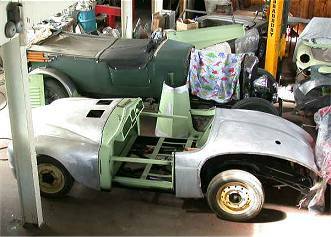 However, body parts from scrapped Jupiters have been collected (except for bumpers) and assembled onto the chassis unrestored. ABOVE: The New Zealand replica R1 at a show in Ellerslie providing a history of Jowett racing. Four Jupiters at the Henstridge flying day, Sunday 20 April 2003. 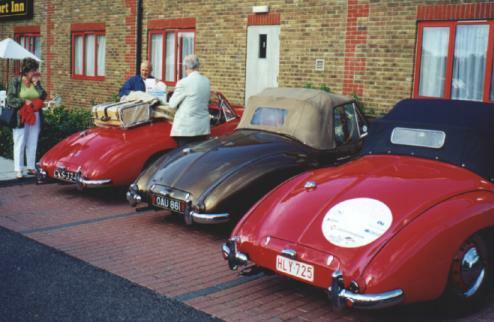 Left to right: the ex-Pat Lockyer SC (now owned by Mike Worker) driven by John Rutter, Tony Young's Jupiter, John Blazé's Jupiter, and of course the Farina of Pat Lockyer. The air display was on Tony Young's personal airfield. 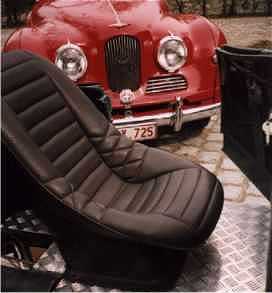 This photo is from Jaak Jacobs and it shows a racing seat in his second Jupiter, whose restoration is now complete. Yes - competition motoring is in mind! You can see keys in the ignition (far right). 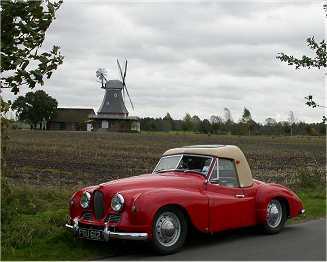 Jack Jacobs, Belgium's only Jupiter owner, is doing a splendid job in this restoration. 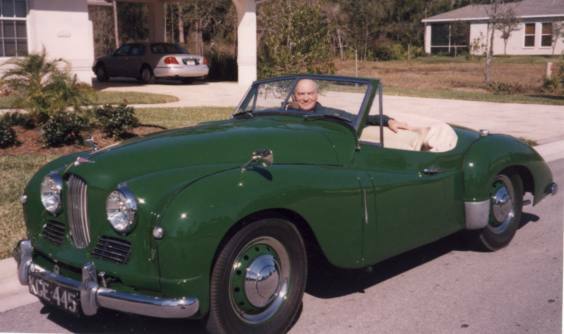 The green Jupiter was an absolute ruin when Jack bought the car in 1995. Now (October 2006) registered and on the road. Jack is doing much of the work himself. You can see the excellence of the door fit here. Although a USA import, the steering wheel centre has (and had when imported) an engraving of Brussels cathedral with the name Brussels added! 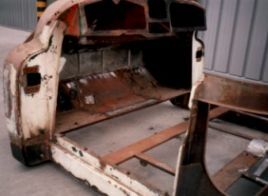 Here is a view of the rusted-out bodyframe taken about two years ago. Jack and his friends have worked wonders in the intervening time. The seats look to me like racing seats. Could this be one of the successful USA Jupiter race cars? Vero Beach? Phoenix? Riverside? Torrey Pines? Floyd Bennett Field? These images reveal what could be a cooling system breakthrough for the Javelin and Jupiter, as discovered by the ever-inventive and highly observant Pat Lockyer. The image above shows that the water passages - as manifolded by the front timing cover - have a 3:1 constriction for the right side with respect to the left side. 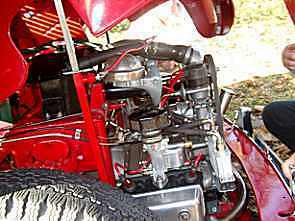 The top and bottom images on the right show Pat's modification, which early tests seem to show a successful reduction in engine running temperature. These are just two photos dating from October 2002 taken from Peter Tribble's website (click on photos) and show how how his restoration is proceeding in leaps and bounds. Have a look for yourself but do come back! 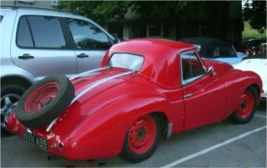 Possibly this website's first picture of a Jowett Javelin. 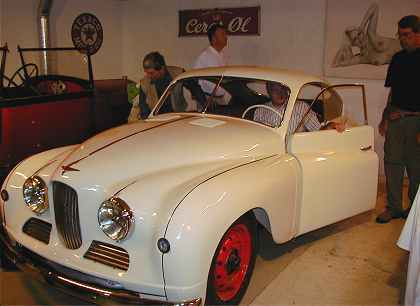 This recent picture is of the Javelin owned by Swedish enthusiast Gustav Joseffson. The pieces of string hold the rally plate in place, not the Registration plate! 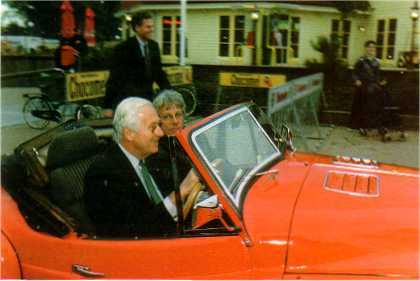 Count Hugo Graff van Zuylen van Nijevelt, the only Dutchman to have won outright the Tulip International Rally (in 1953 in a Jowett Javelin) seen here in 2000 driving Chris & Clara van der Vaart's Jupiter. Hugo is also the youngest driver (at 23) to have won the event. The fiftieth anniversary of this very special "Tulpen" began on 11 May 2003 in Aix-les-Bains. 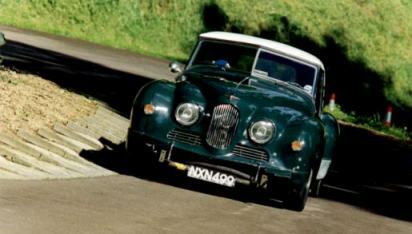 Hugo then relived one of his and Jowett’s greatest achievements; the outright win in the Tulpen Rally 50 years ago. Hugo was the first Dutchman and the youngest competitor at 23 to win the rally and still remembers the emotion he experienced on receiving the trophy. In addition to that achievement, Javelins also won the team prize that year. 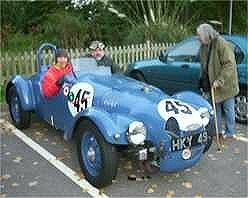 Sunday Nov 4th 2001 - Jowett folk met at the Black Lion, Patcham just to the North of Brighton to watch the Veteran cars go by and to natter about Jupiters etc. Above: Dennis Sparrow about to drive off in the R1. Betty Davis, standing, still owns a Jupiter. 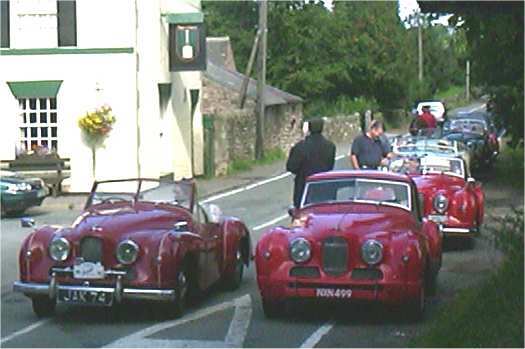 September 8th and 9th 2001 was the Jupiter Owners Auto Club's annual get-together, that year in the Derbyshire hills near Ashbourne. 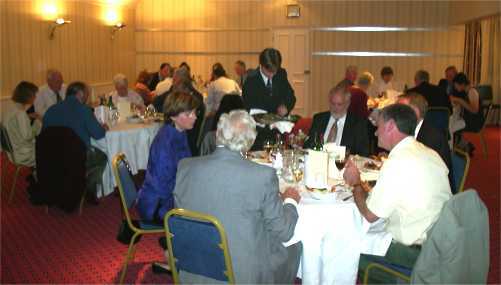 The hotel was extremely comfortable, the food excellent, the ambiance convivial and the waiters attentive. 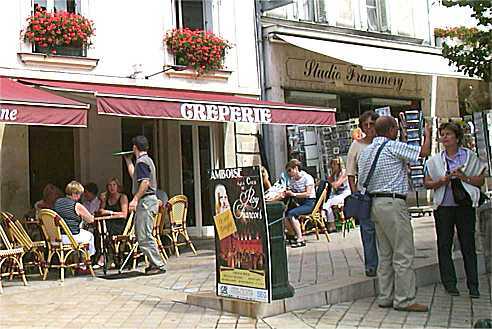 Here is Chris Freudenberg's Jupiter taken in the summer of 2002 in Dieppe. Below is a group of us at work. Table in foreground has Ghislaine Nankivell (in blue), Geoff McAuley facing camera, Mike Smailes in white shirt. David Taylor in grey suit, Frank Woolley behind Mike. Above is a gaggle of Jupiters in the scenic run taking advice on where to go next (we were headed for the famous Crich National Tramway Museum). 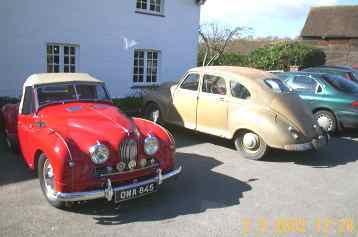 Mike Smailes' newly resprayed and modified Jupiter is in the foreground right, with hardtop. On Saturday June 16th 2001, the R1 Jupiter made it to the start and actually raced at Le Mans for the first time since 1952! Above are two pictures of the R1 Jupiter taken at Scrutineering in the cathedral square in the medieval quarter of Le Mans. On the left, Dennis is just above and behind the roll-over bar. They are thanks to David Legangneux whose website is certainly worth a visit. 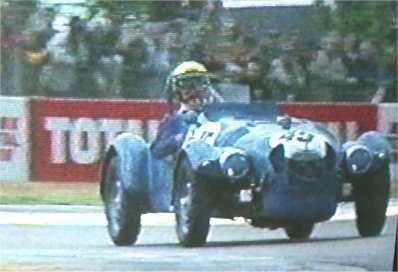 Below: A determined Pete Dixon sets out on the rolling lap following the old-style Le Mans running start. The Lister on pole didn't even complete the rolling lap!!! Hugo Dixon reports "It was a superb weekend, people were fascinated by the R1 and we were inundated with positive comments. It was fantastic that the R1 got to return home to Le Mans and have the rare privilege of racing on the full circuit (and it finished!). 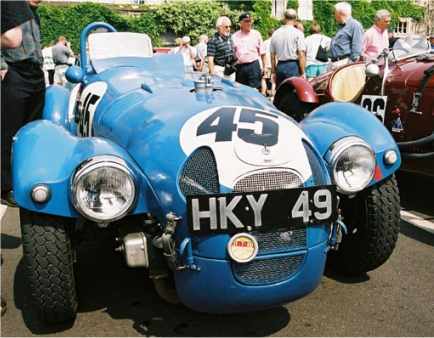 The Jupiter running under its 1952 race-winning number of 45! Here are a couple of pictures from Richard Keil showing the R1 team (less Dennis) burning the midnight oil - L to R Steve, John and Pete. 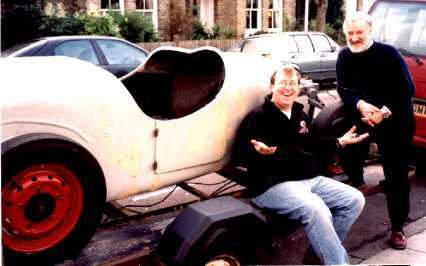 Dennis and Pete are indebted to the unstinting work from Steve Keil (electrics) and John Blazé )special components) without whose assistance the R1 might well not have made it to Le Mans for its birthday party. 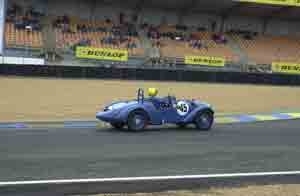 It was the oldest car in the "Le Mans Legends" event. 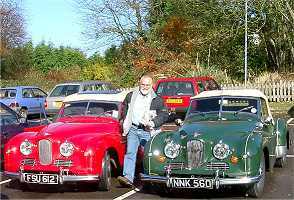 Grateful thanks also to the Jowett Car Club, the Jupiter Owners Auto Club, to the JCC Southern Section, and the many members who contributed cash to help with the cost of getting the car to Le Mans (there was no sponsorship as such). The entry fee alone was in excess of £500! This car has just changed hands in Australia. A lefty, it was restored by Sam Samelik in the USA a few years ago. Thanks to Alan Benewith for E-mailing me the pictures. 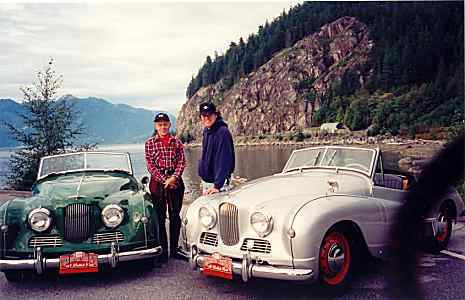 John Blanckley recently (end of June 2000) took part in the Rallye des Alpes, from Geneva, through most of the Alpine passes in Switzerland, Liechtenstein, Italy, Austria, and France. 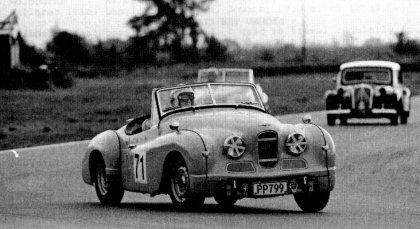 He was leading the class after the third day at 6th overall out of 80 cars, and annoying an MGA which couldn't keep up with him on the uphill sections - although faster than the Jupiter on the straights. Here is a photo of "Hassle" taken by Hans Berends (copyright Hans Berends) at the start of the rally. 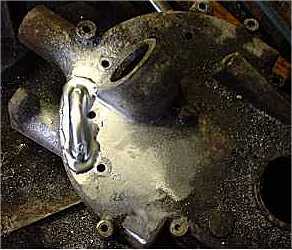 Alas, mid-way on the fourth day the Jupiter's propshaft coupling failed. John patched it up and returned home at 40mph. Caught on camera but only now can it be told - cunning but thwarted attempt at the theft of Philip Dingle's Jupiter on one October 31st. 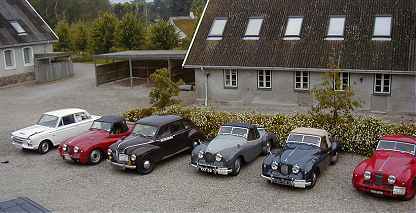 Jaak Jacobs of Belgium, is one of the keenest Jupiter owners I know. Not content with one beautifully restored award winning Jupiter, he has restored another. This snap shows a very rusty bodyframe. Rusty and moth-eaten steelwork has to be cut out and replaced. Jaak does all the welding himself. 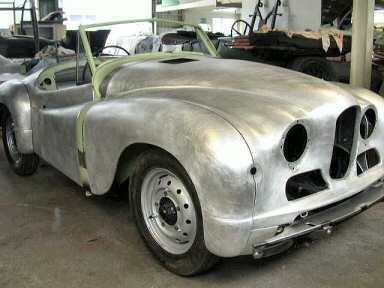 The bodyframe returning from the sprayshop where is was shotblasted and zinc sprayed, ready for fitting to the chassis. It is now better than new! 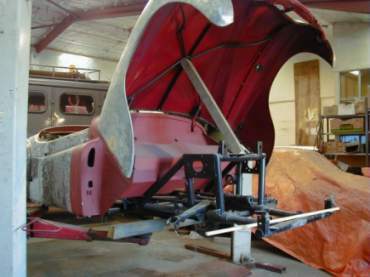 Since this was taken, the bodyframe has been remounted and body panelling is being prepared and assembled. No, this is not posed on the Brooklands banking. Period radio (almost) is fitted. Below that grab handle you may just be able to make out a black box - it's a CD player. The original owner of the above Jupiter, George Dudley, has been to see the car and even drove it, albeit with tears in his eyes - he last saw it 47 years ago!! But amazingly Pat has bought an even more interesting Jupiter. 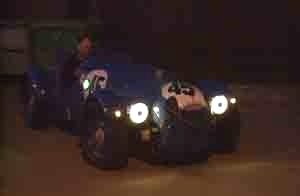 It is the second original prototype and chassis number 5. Although converted to LHD during its sojourn in Canada these last 50 years, the differences between it and subsequent production Jupiters are numerous and of great interest to Jupiter owners and historians. 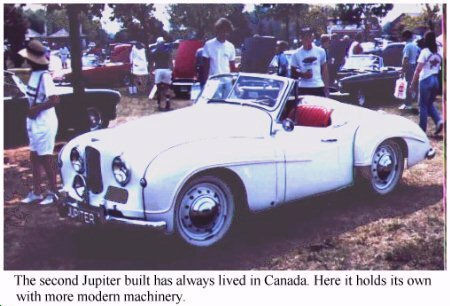 Coincidentally we have heard from a septuagenarian who made the original tooling for the Jupiter, now living in - yes - Canada!.Some time ago William Pitman contacted me from the USA and wrote "Yours is an interesting site. 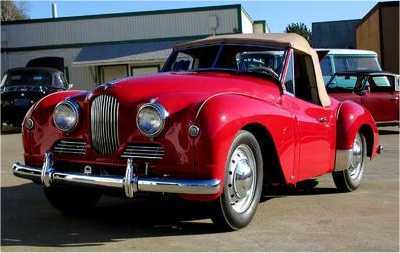 One of the characters in a Ross Thomas novel I have just finished reading expressed his admiration for the Jowett-Jupiter, and I was very curious to see what Thomas was talking about. I'm happy to find out it's such a fine automobile, and that there's a nice group of people restoring and using these cars". 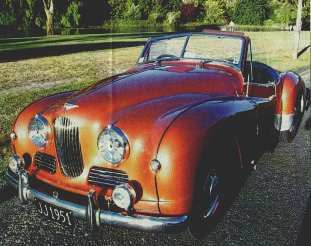 Fanciful Jupiter hotrod as it appears in the April/May 2001 edition of "Flat Four", the magazine of the New Zealand Jowett club. 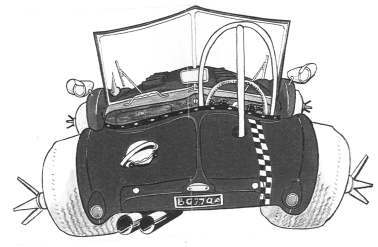 Artist unknown but full marks for authentic details such as the filler cap, late-type rear light housings and spare wheel door. 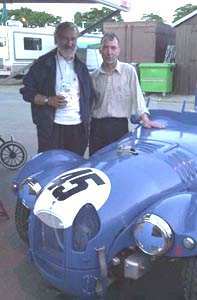 On 16th December 2000 a meeting of minds took place - mainly the owners of the R1 (Dennis Sparrow and Pete Dixon) and the owner of the Swedish near-replica R1, Danny Nash. The Swedish 'R1' hereinafter called 6R for it is chassis number 6, confirmed on the day by scratching away the paint in the expected places. Ed Nankivell was also there and a comparison of photographs took place. 6R was on its way to a panel-man for the work necessary to bring it back to originality - Mike Smailes is acting consultant and go-between. 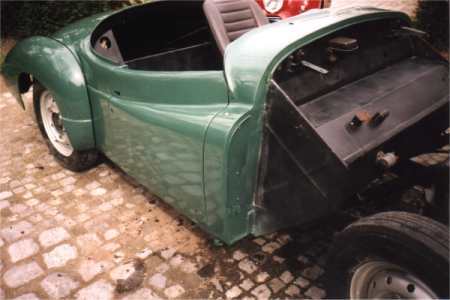 The panel-man has previously restored (with the help of a huge amount of input from its owner Simon Wood) the Le Mans Jupiter HAK 366 seen at the Le Mans tour in June 2000. Pete Dixon (standing) and Danny Nash with 6R in a Twickenham street. Amazingly a Swedish man passed by and offered to translate any original-language material we had difficulty with. 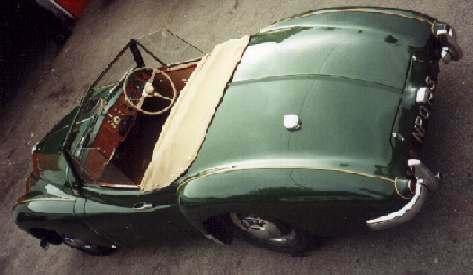 Bonnet appears to be of lift-off design (now confirmed) and held in place with spigots and leather Le Mans-type leather straps. 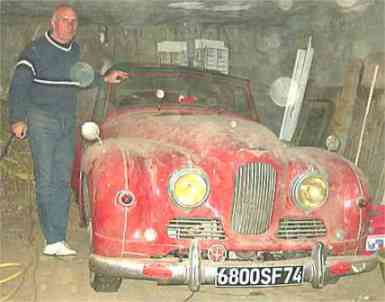 This car is under restoration. This photo and the other three in the series were taken on Saturday 13th April 2000, on an absolutely beautiful Autumn day (writes Leo Bolter of Palmerston North, New Zealand). 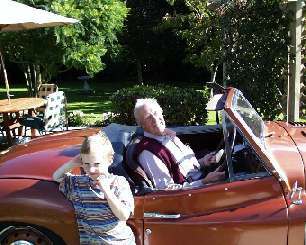 "I drove out in the Jupiter to visit Alan and Daphne Ayson who are Central Branch of JCC of NZ members. The town they live in is about 90 minutes drive south of Palmerston North, at Waikanae. They own a very nice Javelin as you can see in the picture". This photo (foreground - Yorkie's grandson) shows Pat "Yorkie" Williams, who had started working at Jowetts in Bradford after been de-mobbed after the 2nd World War finished. He worked in several areas of the factory, including the body shop. He worked assembling Bradford and Jupiter bodies too, and had a stint in the parts department. He soon remembered that it can be a squeeze to get behind the wheel of a Jupiter . . . made more difficult as he is a few years older now. Well . 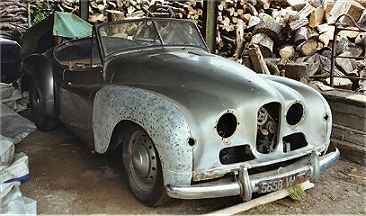 . . it was 1953 when he left Jowett. 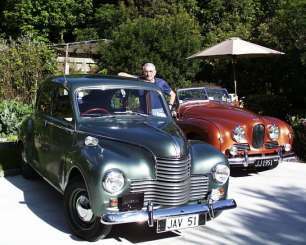 He has lived for many years in New Zealand but only now has he met the Jowett fraternity. clutching the Malcolm Bergin Memorial Trophy to his chest as it is a very great honour to be its recipient and now he was having to give it back! This prestigious trophy normally only gets presented once. 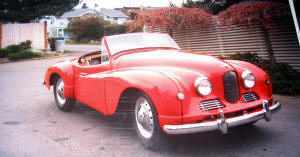 Malcolm was one of the New Zealand Jowett club's founding fathers, and it patron for a number of years until his untimely death from cancer. From the New Zealand Sunday Times of October 29th 2000. If there’s a star in Leo Bolter’s life it’s Jupiter. An early 1950s Jupiter that is. The Massey University staffer from Palmerston North is one of a handful of Kiwis who own what many consider to be the most advanced sports car of its time. 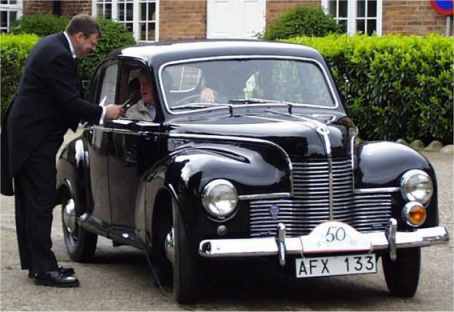 The Jupiter was built in England by Jowett - the same company that built the box-like two cylinder Bradford van and a very aerodynamic four-door sedan called the Javelin. 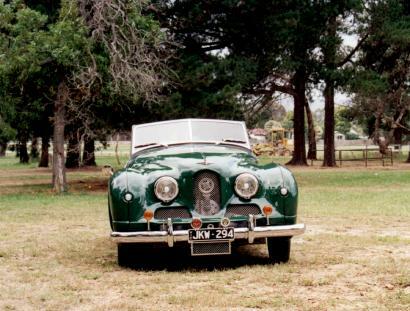 Jupiters were built between 1950 and 1954 when Jowett closed its doors. 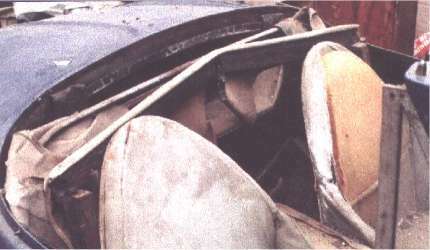 The company lost its body panel supplier to Ford and could not find another. Fewer than a thousand Jupiters were produced and famous owners included Peter Ustinov and Red Skelton. Its styling was considered ahead of its time. The maximum speed varied from 142kmh to 161kmh – good going for a 1486cc engine. 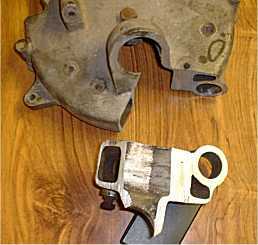 The car even had rack and pinion steering at a time when most cars had the more vague “worm and peg” steering box. 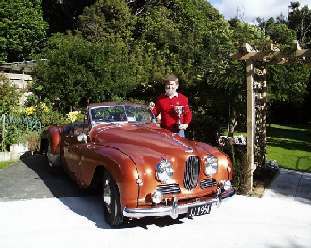 Leo often drives his Jupiter on visits to other Jupiter and Javelin owners around New Zealand. 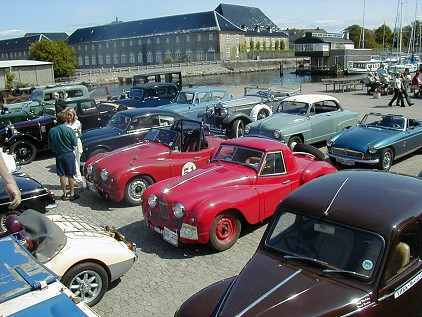 Here is a new website for the classic car enthusiast. It can be found at http://www.bolide.co.uk - it takes the form of a magazine, with photos, events, a directory, etc. Well worth visiting often. This USA Jupiter as prepared by its owner Derek Chambers to come to Europe for the Le Mans 50/2000 Jubilee tour of Northern France next week, taking in the Le Mans 24 Hours race last June. It drove over 1500 miles in the UK and France without any troubles. Rather nicely, US regulations allow it to wear its original British registration plate at the front. The Jupiter was imported to the USA many many years ago as a parts car. On realising it was too good to break, Derek restored it and it is now running well. 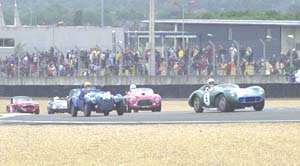 For more information on the race you should switch to the Le Mans year 2000 page. Jack Jacobs (see below) came to the UK in the summer of 1999 and to Le Mans in June 2000 as did Geof Butterwick's bronze Jupiter. Three touring Jupiters. Hoods raised for the overnight hotel stop. 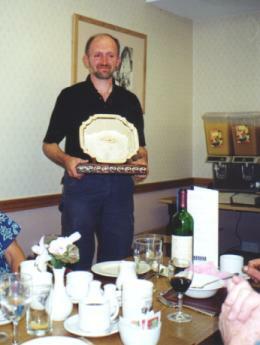 Jaak Jacobs receiving the Reg Korner Memorial trophy, a well-earned award for his work on two Jupiters and winning trophies in Belgium, Holland and Germany with the red Jupiter shown above. Thanks to Bryan Davis for this shot of the ex-Marcel Becquart Farina Jupiter (Monte Carlo Rally 1952, 1953) living it up in New Zealand as Becquart would have liked. 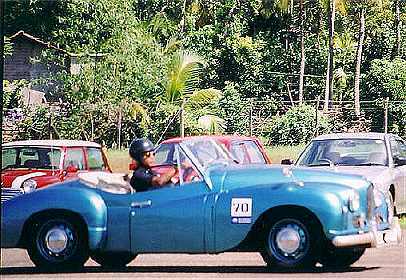 Seen here at the Regularity Trial at the Whangarei Festival of Speed 29th to 31st February this year. 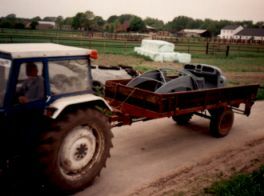 Here are a couple of photos of Mike Allfrey's Jupiter following a root-and-branch, ground-up, total restoration, with Mike doing the vast majority of the work himself. 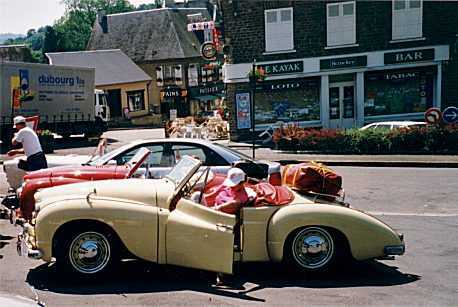 Mike is bringing his Jupiter all the way to England to take part in the Le Mans 50/2000 tour next June. 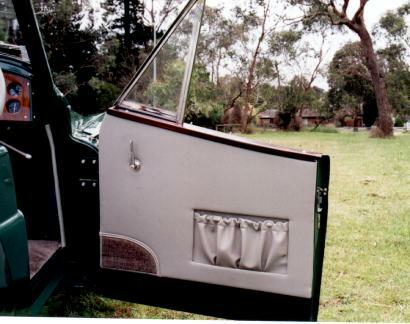 Registration number is the original UK mark, allowed in Australia for a modest fee providing it is not already in use. It is a highly desirable Bradford registration mark. 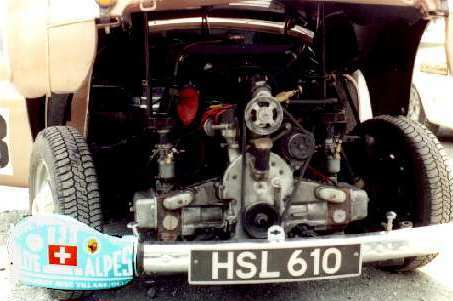 Rectangle below registration plate hides oil cooler. Lack of correct centre grill means you can see the water pump pulley and front timing cover! 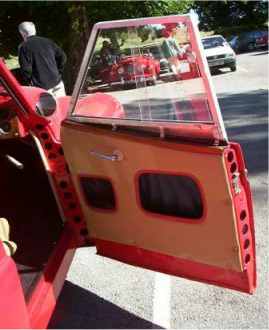 You won't see another Jupiter with door trims like these. They are trimmed the way Mike wanted it, in the colour he wanted it. Mike has converted the internal door catch release into a lever. Here are two shots of Ib Rasmussen's Jupiter in the panel shop. 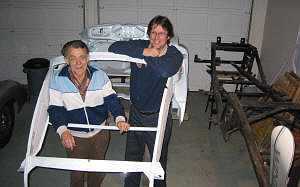 Ib, of Niva, Denmark, has continued the restoration began a number of years ago by Niels Jonassen. Niels found the Jupiter abandoned and much hacked about by an enthusiastic but misguided amateur. 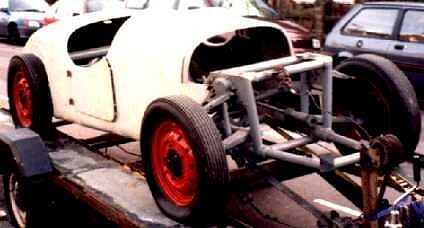 As can be seen the chassis frame has been restored and the cuts in it repaired. panel beating of the body panels is in full swing but much work remains to be done. A Jupiter project changes hands...many thanks to Bob Bateman for his sterling work on the car over the past 8 years. It was indeed in a poor state when he bought it. The torch has now been passed to Len Johnson. Jupiter owners will recognise the shapes of engine crankcase halves in the foreground; a fully overhauled engine has been installed. 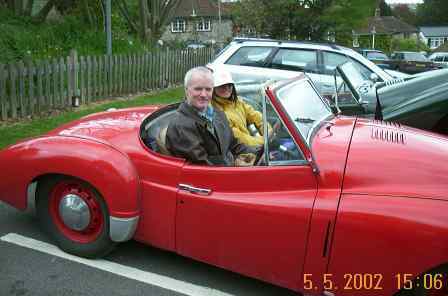 Pat is a daughter of well-known Jowett figure for many years past, Frank Cooke. 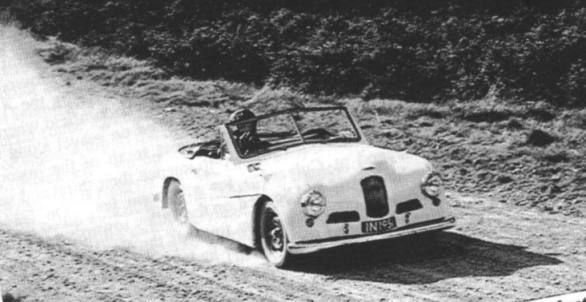 Frank and Bessie Cooke's other daughter drives the Farr-bodied saloon Jupiter that took part in the 1952 Monte Carlo rally, so Jupiter motoring is well and truly in the family. 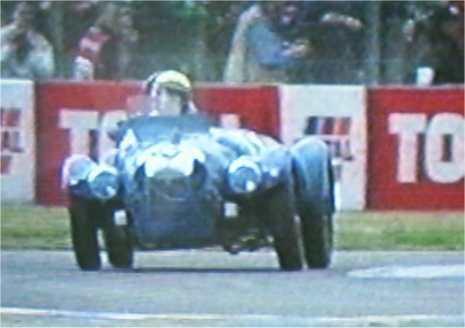 Bugatti Owners Club Classic Hillclimb at Prescott was on 5/6 June 1999. The Jupiters of Mike Smailes and Frank Woolley were entered with Mike (see photo below) fractionally the faster, although half a second outside the modern-day Jupiter record of 63.03 seconds set (by Mike) back in 1987. Huntley Perry and his wife (visiting from Maryland, USA) attended both days. 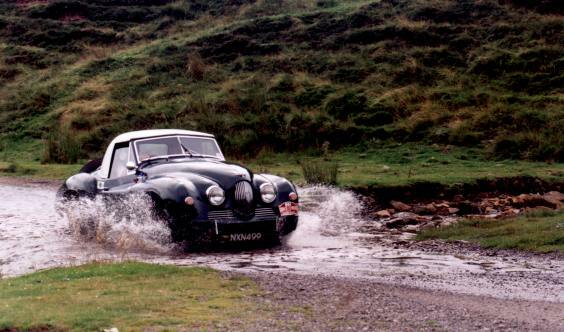 Another photo (below) shows Mike Smailes' Jupiter taking the waters during the Scotch Corner rally last summer. 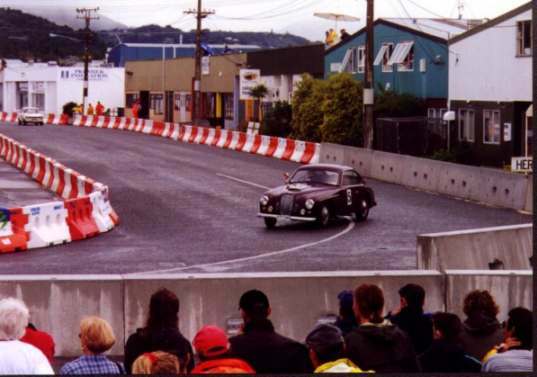 The picture shows the Richard Mead Jupiter ascending the Ashley Forest climb, near Christchurch, South Island, New Zealand, October 3rd 1999..
With the passing of Gerry Palmer we lose the last major link to the origins of the Jupiter - Palmer was responsible for the engine and suspension (those all-round torsion bars and that Panhard rod!) and power plant layout. 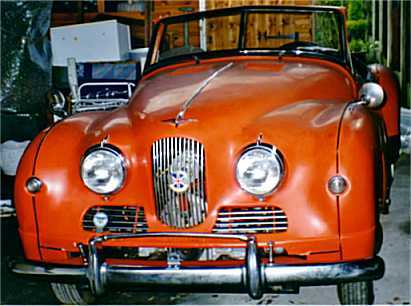 Jonathan Wood, writing in The Automobile of October 1999 commented that the demise of Jowett was rooted in the decline in demand for the Javelin which, Wood says with some truth, had exposed Palmer's limitations as an engine designer. Bob Culver is an astute Jowett commentator, and Javelin driver from way back, with a wry sense of humour. He assessed Palmer (in the Oct/Nov 99 magazine of the New Zealand club) as "the designer of the Javelin, and responsible for most of our pleasure and pain. Probably one of the last designers of popular cars to be given a free hand. As a first attempt by a relatively young designer working more or less alone, the Javelin (1945) was a remarkable achievement". New Zealand, one recent summer Sunday, at the Ruapuna Raceway. 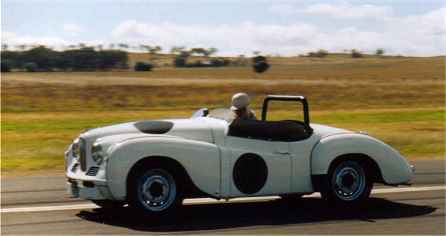 This a picture of Doug Rath's Jupiter which he ran at the Leyburn Sprints, a round-the-houses 3/4mile sprint held about 2 hours drive inland and slightly Southwest of Brisbane, Queensland, Australia. This event is nearly invitation-only as it is so popular, and caters for vehicles from day 1 to just yesterday, PROVIDED the car has some kind of classic pedigree. 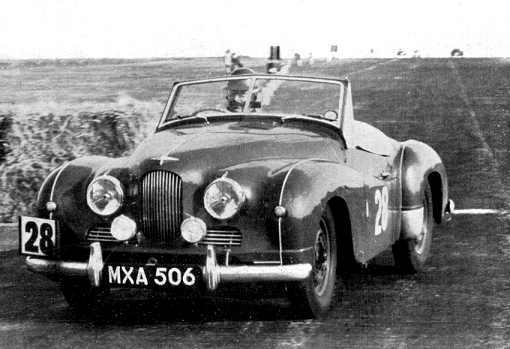 The death of Arthur Wylie prompted this article on the fasted Jowett-powered vehicle ever built. 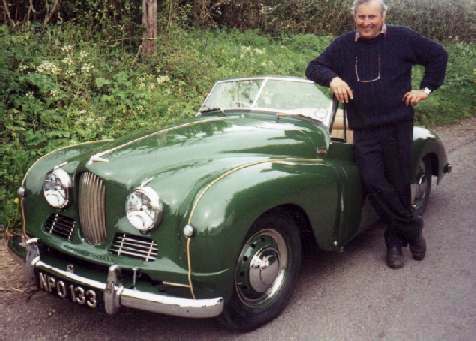 Arthur Wylie (30/7/11 to 26/7/97) never owned a Jowett Jupiter. But his own-designed own-built super-charged Javelin-mid-engined single seater was a F1 car of advanced design which was constructed before anyone knew which direction F1 was headed. 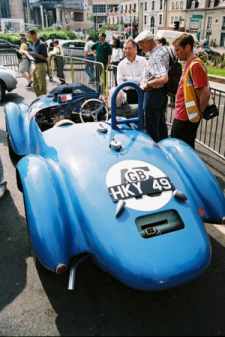 It was designed in 1949, running in 1950, exhibited in 1951, racing in 1952. 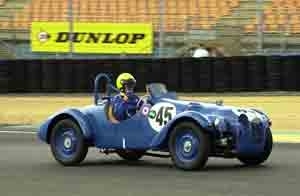 In the Australian GP of 1953 the car finished 9th from a field of 40 starters. 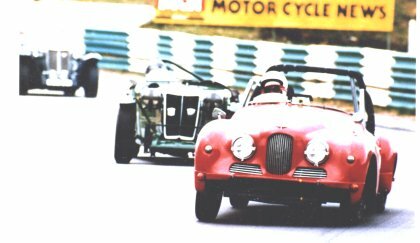 In the Victoria Cup of 1954 it spent most of the 64 laps ahead of Jack Brabham, easing back three laps before the end due to tyres being down to the canvas. Yes, Arthur Wylie was an Australian, which probably explains why his innovatory design seldom gets the credit that is its due. (With thanks to the Australian JCC Newsletter "The Javelin"). Now the Wylie has been added to the Caudo stable. 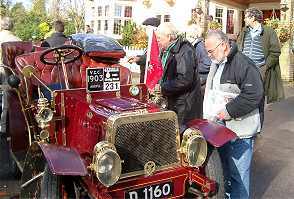 Its first outing under new ownership, Christine Caudo tells me, was the Australian Vintage Sports Car Club Stampede on 7th December 1997. For 1998 it is acquiring a new, bigger supercharger. As I write (29 June 98) the Wylie is ready for track trials at Australia's Wanneroo Raceway, following an extensive refit. Silverstone 5 May 1951: BRDC International Trophy. 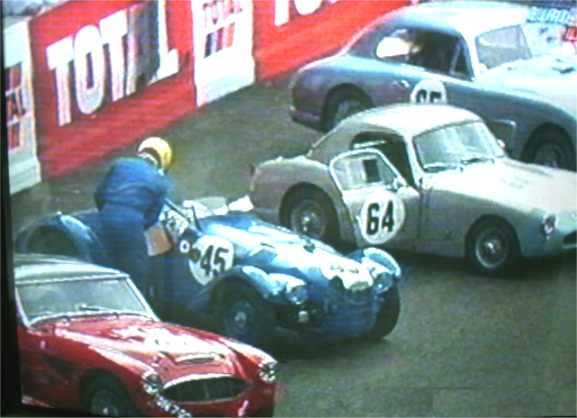 The 1950 Le Mans class-winning Jupiter is sandwiched between Le Mans Replica Morgan and an MG TD. 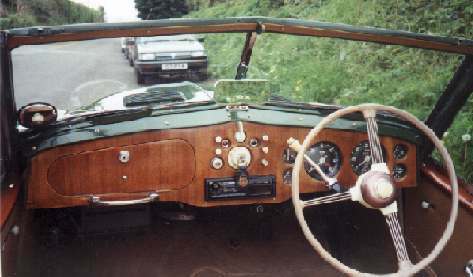 Like the TD, both the Morgan and the Jupiter were in road trim. PYE MOTORS CLASSIC ILLUMINATIONS RALLY 25/26 October 1997. 450 miles of mainly forest and lake district roads.The scenery was spectacular and large crowds of spectators turned out especially at the five water-splashes. One ford was over a foot deep with submerged rocks and a breakdown truck ready to winch out the failures, which did not include the Jupiter, prepared as it was for underwater operation...there were various tests along the way (the one at the prom at Morecambe had a loudspeaker commentary) and the 4am bedding down for the overnight stop was ameliorated by it being the weekend of the hour change. 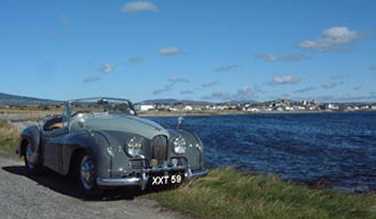 The Smailes Jupiter came first in class ahead of a 58 Riley 1.5, a 61 Sunbeam Rapier, etc, at 15th overall. Earlier in the month Mike Smailes (with Bryan Smith) finished first in class - sixth overall - in the SOLWAY HISTORIC RALLY for Classic Cars. SILVERSTONE HISTORICS 19 October 1997. Keith Clements, Mike Smailes and Frank Woolley in their Jupiters enjoyed a good days racing, albeit with some problems (writes Keith Clements). We attended a briefing to explain the new circuit layout. In addition to the changes made last year, they have made Brooklands and Luffield much tighter, so much so that a Jupiter without an anti roll bar spends most of its time on three wheels. During practice Mike was hit by an Austin 7 Special 750 Racer which came sideways at the Jupiter (the Austin having itself been nudged from behind by another car) spinning Mike off the track at the exit from Luffield. The Jup's strong door pillar bore the brunt. All drivers were brought before the clerk of the course because few had followed the correct procedure of entering the pits when red flagged. The damage was a bent wheel, broken radius rod, rear wing and door bodywork. 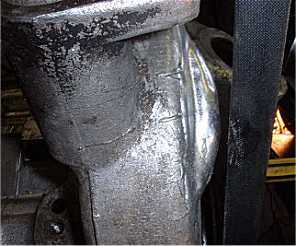 Mike's friends welded up the broken rod. Mike borrowed Keith's spare wheel and so was ready for Race 3. Meanwhile Keith and Frank had taken part in a 20 minute High Speed Trial. You have to complete a set number of laps - but for some reason known only to the handicapper Frank had to do 12 and Keith 13. 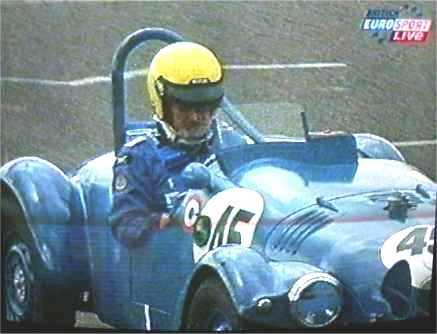 All went well until Frank ran out of petrol, despite his having checked the level with a dipstick before the race. Keith achieved 12 laps in 19m 33secs, winning a second class award, and a fastest lap of 1:29:49, compared to Franks 1:34:42. Race 3 saw all three Jupiters in action. The handicapper for some reason put Frank 35 secs behind but one lap up on Mike, equating to about 60secs start. Keith was 5secs behind Mike, who was on pole. Perhaps he thought Frank was on a one petrol stop strategy again. Keith quickly overtook Mike who was unsure of the handling with one odd tyre. There are so many different cars in a handicap which can upset your line into corners. Keith managed a spectacular spin at Becketts, having had to brake to avoid a car passing on the inside. Luckily he recovered quickly enough to pull out in front of Mike who then overtook. Just before the finish Mike was pushing hard around the exit to Luffield when his rear wheel lifted, the engine started clattering and he pulled off into the pit lane. What a shame! His momentum probably would have taken him to the finish. The cause was a broken valve spring and retainer soon repaired. Much to the relief of the Jupiter men there were no bad noises when the car was restarted, so the team was ready for the team handicap race. This time the handicapper gave Frank and Mike 20secs start on Keith. Keith was on the limit and gaining when he was pushed wide with two wheels on the grass at Brooklands. A spin shot him straight across the track between the two faster cars. Another spin on the grass pointed him in the correct direction. This lost some positions but the team still finished fifth out of 10. 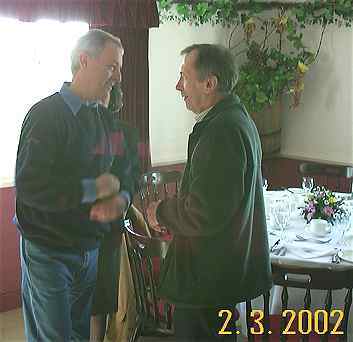 JOAC AGM 2002 was held at Whittlebury on March 30th. The two red Jupiters are of Jonathan Root (left) and Chris Freudenberg. Jonathan Root is far left, talking to Peter Tribble. Tony Day (blue shirt) drove up from Dorset. A blank veneered instrument panel is being checked. Pat Beeden, former Jupiter owner twice over, now has another one! 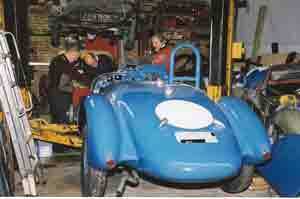 ...was only installed in the two prototype Jupiters, chassis 1 and 5. Frank Fryer (owner of Jupiter No 1) had this to say: "I found a wool glove inside the seat when I was re-upholstering the drivers seat. It was between the aluminum pan and the foam cushion. 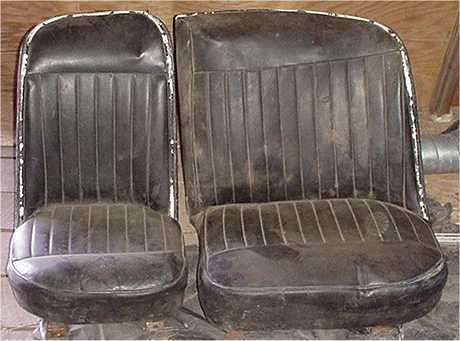 Therefore it had to have been there since the seat was made. The glove kind of looked like a winter work glove". 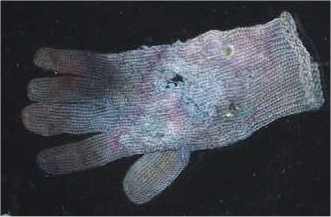 Above: the glove as found upholstered into the driver's seat of Jupiter No1. Below: New look to Chris Freudenberg's Jupiter. 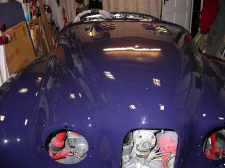 Chris Freudenberg has now sprayed his hard top black, so that it looks less bulky. See below for hardtop in beige. 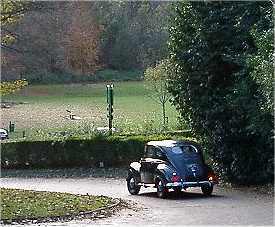 The Jup is pictured late February 2003 in Highbury Barn, London England. Have a look at Rick Jowett's website but please come back! 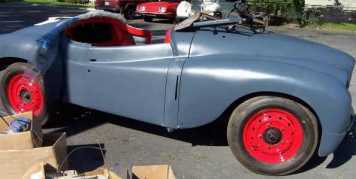 You will see a well restored and very authentic example a a Jowett Jupiter. Exciting news! A Jupiter has turned up, well restored, in Brazil! 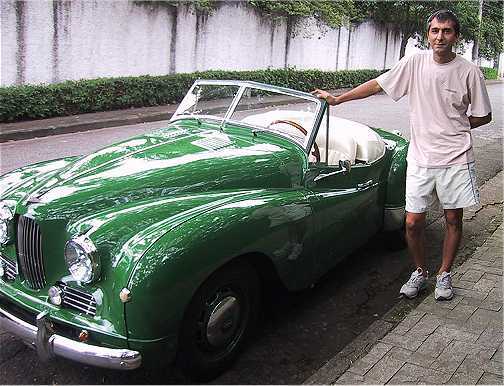 All we know from its owner Jean Carlos Machia is that is it an original Brazil Jupiter and is probably (from its body number) chassis 696 or 710. Jean sends his greetings "nós temos bananas!". Jean knows of a total of three other Jupiters in Brazil, so four of the eight Jupiters exported to Brazil are known to survive. Above - the Jupiter of Marshall Jackson, of California, after its recent professional rebuild (completed 7 January 2003). 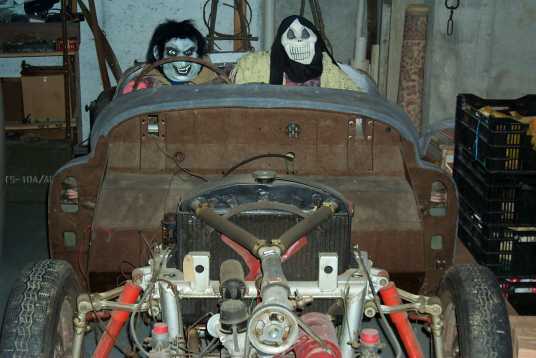 The car has been in his family for nearly 40 years. 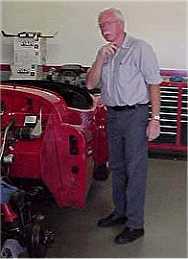 Lawrie Alexander , proprietor of California's British Sportscar Center where the meticulous restoration work was carried out. New arrival in the UK. This LHD Jupiter has been imported from California by Mike Chevers. 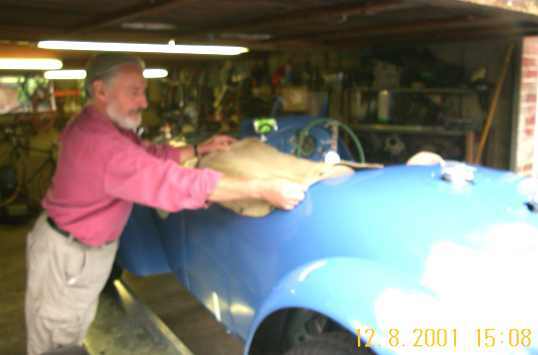 Mike is already working on the car, sorting its engine and re-veneering the instrument panel. As can be seen, much work has been done on it, and it may even be ready for Mike to take on the Jupitour next July! Asoka Wijesurendra at speed on Sri Lanka's Katukurundra racing circuit, a special test on last year's 50km Colombo Rally. Asoka has restored his Jupiter twice! It now has the correct Jupiter windscreen, shipped out to Sri Lanka two or three years ago. BELOW: Two pictures from North America's West Coast. 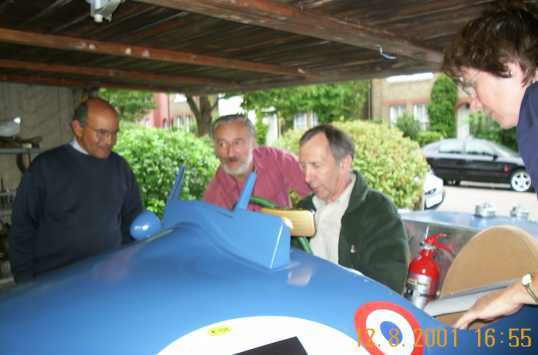 West Canadians Mike Stout (left) with John Kenna and part of JK's Jupiter which as you can see was then under restoration inside his house!! Jack Caldwell of Seattle has quietly been restoring his Jupiter retrieved from a blackberry bush in 1968. Here it is today. 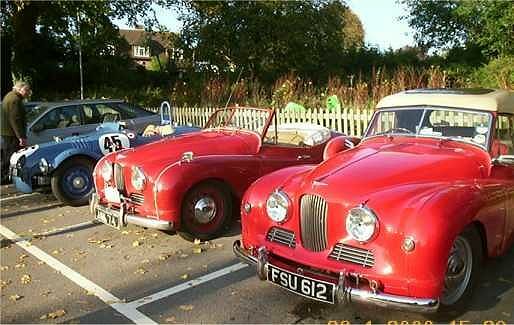 Here are a few photos taken at the London-to-Brighton VCC Run, 4 November 2002. Ed Wolf from Sidney Australia was with us - scroll down for a picture of Ed's most recent Jupiter acquisition. Ed Wolf arrives in the red Jupiter of Chris Freudenberg. 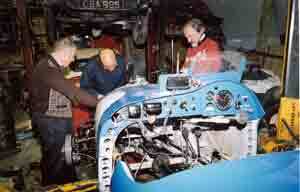 Ed Wolf inspects engine of Jupiter man Tony Young's Argyll, a regular VCC runner. Far left: John Blazé, Ed Wolf, Chris Freudenberg. Centre: Mr and Mrs Hodgkinson. Here is a picture of Ed Wolf's "other" Jupiter. 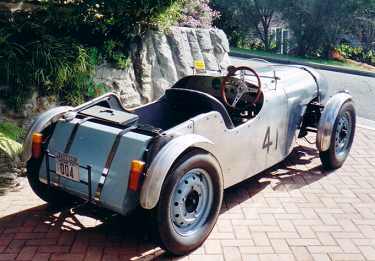 It is the Duckett Special, built (in Australia, where else?) in 1951 and has covered a little over 3,000 miles from new. Apparently it weighs just 13cwt. The UK-based Classics Magazine of May 2002 writes "Another title filling one of those irritating gaps in motoring history. The...pictures accompany a detailed and involving story...considering the effort that has gone into this book, it is an inexpensive purchase". Chris Freudenberg has recently visited Hamburg with his Jupiter. He met there German Jupiter owner Werner Bald and his wife Ilse. 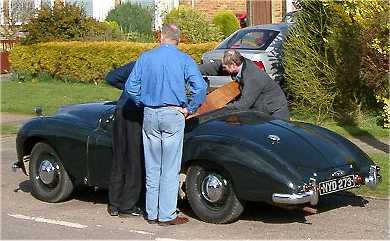 This Jupiter, seen here at Silverstone on 13 September 1952 where it won the Motor Sport handicap, is back in the land of the living after being dismantled many years ago. It is now owned by Bob Mooney, the same man who owned it back in the late 1960s. 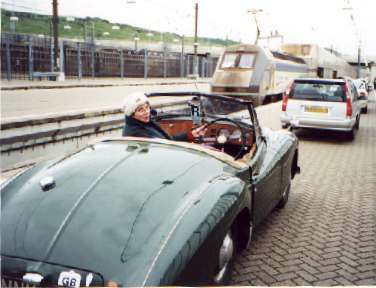 Chris Freudenberg took his Jup across the channel twice in mid September 2002 - Photo above: seen here with Dieppe castle. The long-planned 2002 Danish trip has finally been, happened, and gone. Well done Ib Rasmussen and all your helpers. One is the only LHD special bodied Jupiter, Danish-built and Danish restored (well nearly). Keith Clements, far left. Above: a small collection of cars includes an originally Dutch Jupiter and of course the yellow Bradford van. Above left: Four Jupiters and a Javelin (I think Geoff McAuley's) can be seen - the two-tone grey Jupiter is that of Angus Bell, to the left of David & Barbara Peacock's Jupiter. Left: The all-red Jupiter of Mike Smailes is to the right of Keith Clements' much rallied example. Aerial view of the 2002 Jowett employees re-union meeting at the Bradford Industrial museum. Thanks to Jon Downing for the picture. 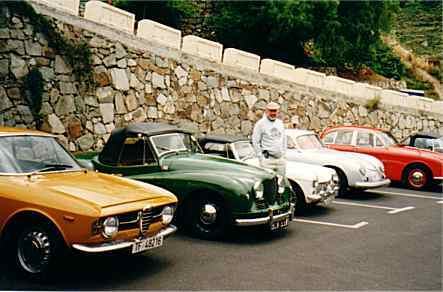 Tim Wise and Jupiter in a meeting of mostly more modern classical cars in Tenerife. 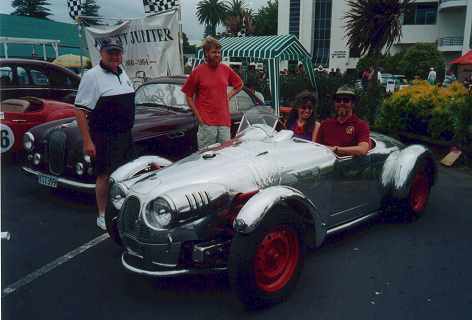 Here are some pictures from the Australian National Jowett Rally in Wellington, New South Wales May 2002. Doug Rath writes "Our trip began on the Wednesday before Easter, driving through constant rain on Thursday to arrive at Wellington on Friday. Our Queensland contingent did well in all the activities with Barry Houston winning Best Jupiter and Brian Holmes the Motorkhana. Overall rally results placed Barry Houston first". The Queenslanders covered 1515 miles with only some ignition bothers on a Javelin for the whole trip. Above: Doug Rath at speed on the Mount Panorama Raceway, Bathurst. Above, left to right: the Jupiters of: Mike Allfrey, Maurice Stone, Brian Holmes, Doug Rath and Barry Houston. 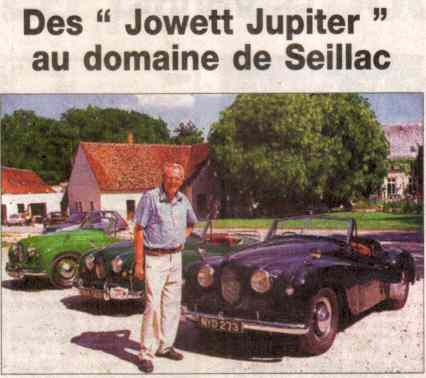 Ed Wolf writes: "I now am the proud owner of a car I have been chasing for 25 years, the Duckett Jupiter. 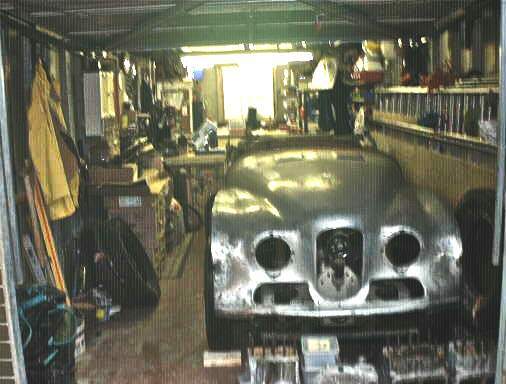 The car came complete with a new spare engine, crankshaft and cam shaft and 4 Pirelli Cinturato tyres and tubes as well as being fitted with Hardie Olympic cross ply tyres. The speedo still reads 2,675 miles as it did in 1979". 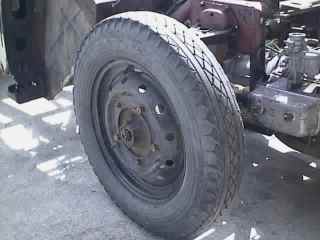 "When found it was covered in dust and 1986 newspapers but the tyres were inflated and the brakes seem OK. I changed the battery, oil, fuel and water - turned the engine over by hand - added to upper cylinder lubricant to free up the valves - switched on - pressed the starter button AND -..IT FIRED UP first time! The car is really just a chassis with an aluminium envelope. Probable all up weight 1/2 a ton so it should move...". 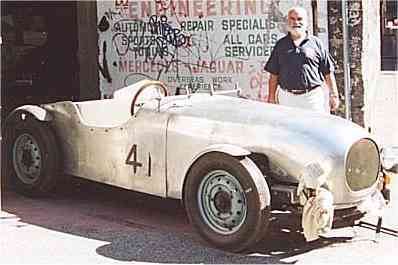 Here is a picture of Frenchman Jacky Gruz with his 1954 Jupiter chassis 1018. That's right, only fifteen more Jupiters were waiting to be built. He bought it in 1986, ran it for two years including a couple of Classic rallies in his part of France (near Evian), then laid it up with a gearbox disorder. Having restored his other classic, a Moriti 600cc Fiat, the Jupiter's time has come. Photo above taken in April 2002. 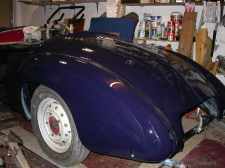 The car is now restored and running and powered by an Italian Flat-4 engine for the time being. Rick and Lana's two children, James (6) and Jessica (5), (see picture below) help prepare the Jupiter for display at the Concours d'Elegance in Galveston Island, Texas on the weekend of November 3rd, 2001. It was taken in the early morning just prior to the show. The car was very dirty from its ride the previous day from NW Houston, about 100 miles away. It was the Jaguar Club of Houston's 23rd Annual Concours d'Elegance. 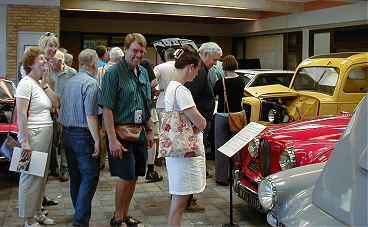 The event was well attended and included over 300 show vehicles on a beautiful sunny fall weekend with temperatures in the high 80s. 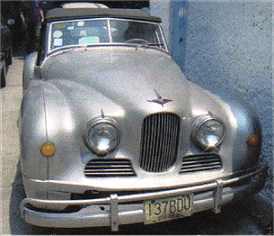 The Jupiter placed first in the British Special Interests Class (everything except Jaguars, i.e. 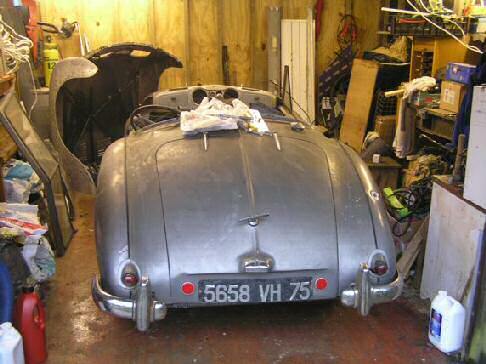 Austin Healey, MG, British Standards, Lotus, Triumphs, etc. Rick writes "The Jupiter passed a challenging brake and handling test sequence on the way to the event. On the I-45 freeway 10 miles north of Galveston Island, a group of passenger cars stacked up in front of us and I had to invoke accident prevention skills at 65 MPH to avoid a wreck. Fortunately, the vehicle responded very well to my instructions..."
Doug Rath goes historic sprinting in his Jupiter. Venue, Leyburn, Queensland Australia. 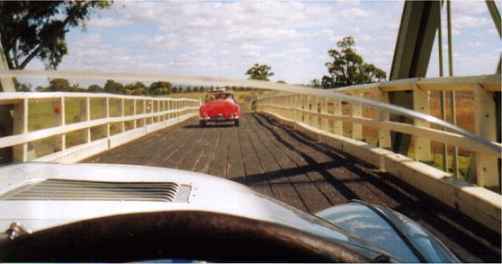 Information given below first appeared in the Javelin (newsletter of the Australian Jowett Car Club) in the September - December 2001 issue. Doug Rath writes "We didn't have time to walk the track, which is something you always should do. This year the chicanes were haybales and these bloody big tractor tyres, which caused a lot of damage to a couple of cars and were removed for Sunday. It was great to park next to Brian and Barry's Jupiters after each run and display the cars to the crowd". Doug continued "Each Even we line up outside the pub and then go to the start line one at a time. The flag falls, full throttle into second, slide through the 90 degree right hander, and accelerate into third up the front straight. Pick the line through the chicane at about 80km, then on the brakes to slow for the 90 degree left-hander and a quick chicane like a tunnel. Full throttle up to turn 3, another 90 degree left with the tail out using the entire track. Then down the back straight, through a quick chicane and across the finish line at about 110km. All this took about 63 seconds in the Jupiter...". "The track is very tight to keep speeds to about 160km/hr for the really quick cars. I only got top gear for a short spurt across the finish line. 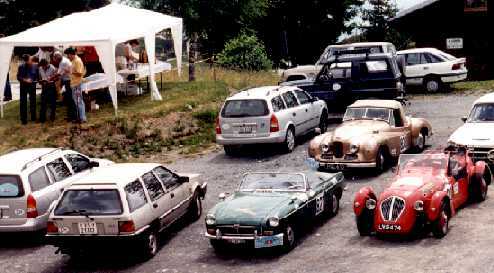 Only three cars in my group because an MG TC didn't front, the others were an MGA Twin Cam and a full race prepared MGA. 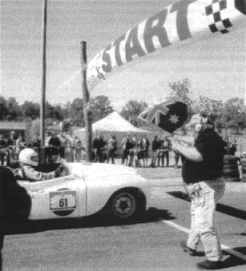 I beat an MGA a couple of times but finished overall three seconds behind in the third. Collectors item! 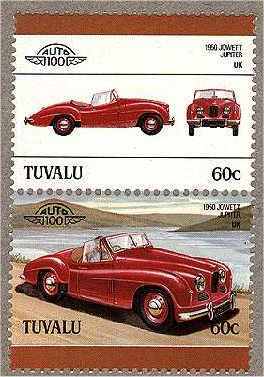 These stamps, part of Tuvalu's erudite range of collectable postage stamps, were obtained for me some time ago by David Taylor, the Jupiter Owners' Auto Club's indefatigable Spares Procurement Officer see Spares and Services. Tuvalu, an archipelago in the South Pacific, is in the news today (18th November 2001). The country (population 11,000) is under threat from global warming. Sea level is rising and the highest point is now only 4.5 metres above sea level, presumably at high tide. New Zealand is stepping in with an offer to settle all the inhabitants. One can imagine the upheaval for both the Tuvalu people and New Zealanders and can only say - well done again New Zealand. 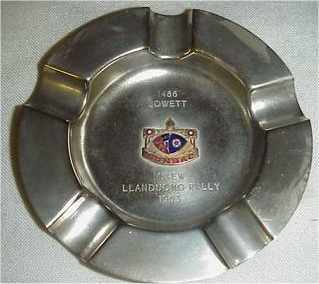 ...a trophy won by Maurice Tew in his Jupiter - now owned by Tony Mumby. 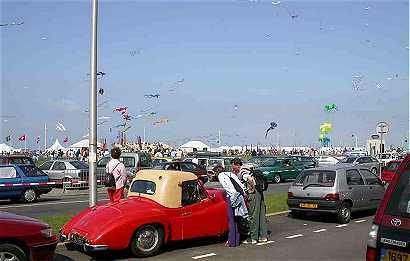 The cancellation of 2002's Manx Classic event did not deter five Jupiter owners from taking their cars and wives to the Isle of Man. The party comprised:- John & Pat Rutter, Craig & Glynis Ainge via Liverpool; David & Barbara Peacock and Angus & Shirley Bell via Heysham - arrived on Sunday 17 September and were joined by Keith & Jenny Clements on Tuesday. 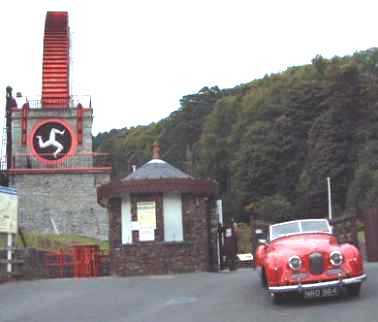 The terrain on the Isle of Man is ideal for Jupiters and amazingly given the weather in Britain that week the intrepid Jupiteers escaped rain. We enjoyed an excellent scenic route devised by David Peacock, which took in the TT course, the motorcycle museum as well as seal-watching! 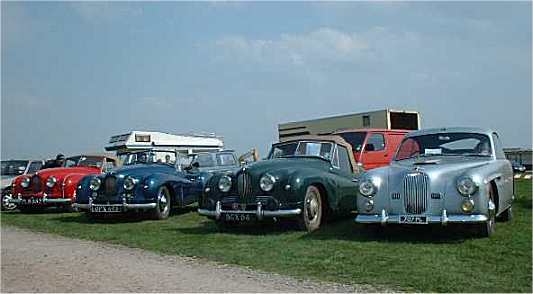 Above: the full line-up of touring Jupiters at Peel. On the left, Keith Clements rally Jupiter.